"The Rosetta Stone of Bush Family Crime"
What if a criminal cabal took over the US Government and used its operations for its own profit? Before they stole the White House, the Bush Cabal was the First Family of Fraud. According to former government operative and whistleblower Al Martin, this is how they did it. A self-described fourth level player of Iran Contra, Martin has first hand knowledge of the dirty deals, high-level scams, frauds, and treasonous activities of the Bush Cabal. 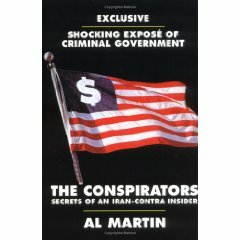 Al Martin's new book called "The Conspirators: Secrets of an Iran Contra Insider" is a true crime story that's been too hot for mainstream media. Not only is it a shocking and uncensored expose' of Iran Contra scandals, the book is a hidden history of US Government crime and corruption. Al Martin's account include first-hand knowledge of US Government drug trafficking, illegal weapons deals, as well as wholesale fraud by government perps -- securities fraud, real estate fraud, and insurance fraud. When George Bush, Bill Casey and Oliver North initiated their plan of State-sanctioned fraud and drug smuggling, they envisioned using 500 men to raise $35 billion. When Iran Contra finally fell apart, they had ended up using 5,000 operatives and making $350 billion. And who is Al Martin? After Al Martin retired as a Lt. Commander from the US Naval Reserves, his life went into the fast lane as a black ops specialist in the Office of Naval Intelligence. His first assignment was in Peru, where he was tapped for a CIA-sanctioned operation, smuggling American Express cards into Argentina in 1979. After that he met US Government-sponsored con man Lawrence Richard Hamil, a Department of Defense shadow player, who taught him the ropes of profitable covert operations. In 1984, Martin began marketing Hamil's "deals" through his Florida based Southeast Resources, Inc.
At a meeting with General Richard V. Secord and Hamil, Martin was briefed about Iran Contra operations and allowed to view voluminous CIA white papers concerning "Operation Black Eagle," the code-name for the Bush-Casey-North program involving US Government-sanctioned narcotics trafficking, illicit weapons deals and wholesale fraud. Now Al Martin tells the facts that the Mainstream Media Cartel has virtually ignored for almost 20 years. "The Conspirators" by Al Martin is unprecendented in publishing history. It names names, dates and events, which no one has dared write or publish before. 8. Insider Stock Swindles for "The Cause"
ORDER IT NOW, while you still can -- before the USA Patriot Act makes it a crime to tell the truth.